first appeared on my private email list. When I sometimes chat with friends we like to talk about things we dream to do in our lives. Often these things involve us to take risks, personal risks we can’t foresee and in most cases like to avoid. Not being brave enough to take these risks we often don’t change anything and keep on doing the things we know. Ultimately this ends up being worse than taking the risk. Existential fear is deeply engraved in our human brains and will do everything possible to hold us back from whatever we like to do. I remember every time I took a “big risk” I had this bad stomach pain. Often for months or years before I actually took the risk. It made me sick, physically sick. Back then, dropping out of high school gave me many sleepless nights. I grew up in a rather poor family. I had to move out early and make my own money because my single mother could not afford me and my 4 siblings anymore. I got a job trial back then that paid me $100 a month for polishing silverware in a hotel. After 3 months they offered me a job (as a full time silverware polisher I guess?) but I declined because I felt that I can do better. Let’s call it a mix of blind stupidity & ambition. I remember how much stomach pain I had in these weeks. I knew, I needed this job and there is no logical reason for me to decline any job offer I could get. I didn’t even had a high school degree, I had zero qualifications. Declining this job offer was one of my first personal “big risks”. After this, many more risks followed, and every time my stomach hurt, often for months in advance. I quit another job, and another job. I eventually opened up my own company with zero savings in my bank account. Years later, I closed my own studio and moved to New York without a specific plan. I quit three more jobs in New York, today I’m back where I started. On my own again. Only a couple months ago I left a nice and cushy job in New York I had for almost 3 years at a well known tech company. There was still stomach pain and weeks of debating with myself if its worth it. But over the years I developed my own strategy of dealing with these risks. There was something crucial I learned when I took my first big risk in declining my first job offer. I defined my own worst case scenario. I knew that whatever happens, I can always go back and find a job polishing silverware or washing dishes. I knew how it was to live on welfare eating instant noodles everyday. Learning this was an absolute relief and suddenly my brain opened up with possibilities. Sure, I had no money, no specific talent and certainly nothing on my resume. But I defined my own worst case scenario. I know the answer. My worst case scenario is polishing silver ware. I’ve been there, and no, it’s not that bad. Even to this day my worst case scenario hasn’t changed. I still know that if everything fails for me in New York, I’m comfortable to move back to a small village somewhere in the mountains and wash the dishes. I told this to myself from the moment I declined my first job offer. The moment I knew, I can be a silverware polisher if everything goes downhill. I believe that in most cases when we talk about “risk taking” that these risks aren’t as big as they seem. In our head things often look bigger than they actually are. 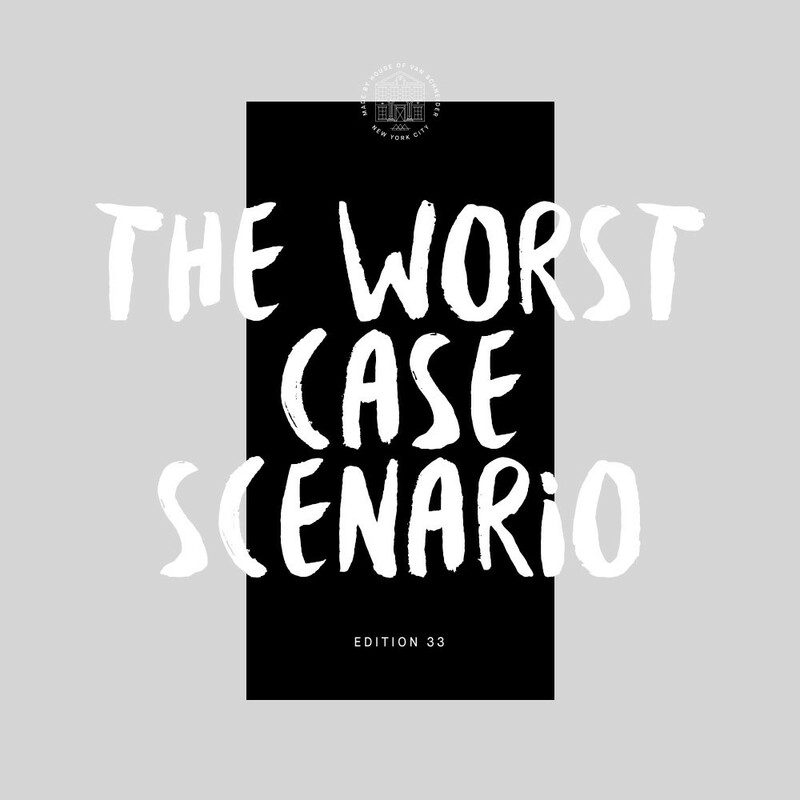 Visualizing our worst case scenarios & fears often help us more than visualizing our goals. Visualizing our goals is common and powerful, but often it comes with defining safety as well. And the moment we think about our safety we reinforce our fears. The amount of suffering we go through by not taking risks often exceeds the suffering we imagine our worst case scenario would bring. So the question is, what is your personal worst case scenario? It’s different for all of us, but often smaller than we think. Tell me yours on Twitter! Tobias is a Designer & Maker +Co-Founder of Semplice, a new portfolio platform for designers. Also host of the show NTMY — Previously Art Director & Design Lead at Spotify & Board of Directors AIGA New York.